The Sky-Riders came into being when CyberFace ruled over the Earth and left Chicago in a state of destruction. The surviving citizens struggled to live best that they could and many ended up visiting with the Creator. A number of different factions were created and the Sky-Riders were one such group. They would be caught up in territorial and food wars with the Rats. 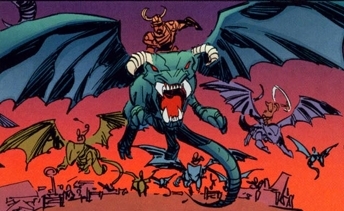 Members of the Sky-Riders clashed with Dragon soon after he arrived in his second reality, following a confrontation with Damien DarkLord. As Chicago underwent reconstruction, the areas that remained untouched became known as the Danger Zone. The Sky-Riders and their rivals remained in this region and as their land decreased in size due to the urban renewal, their actions increased in aggressiveness. Dragon took his wife into the Danger Zone to deal with the Sky-Riders as a favour to President Bush.